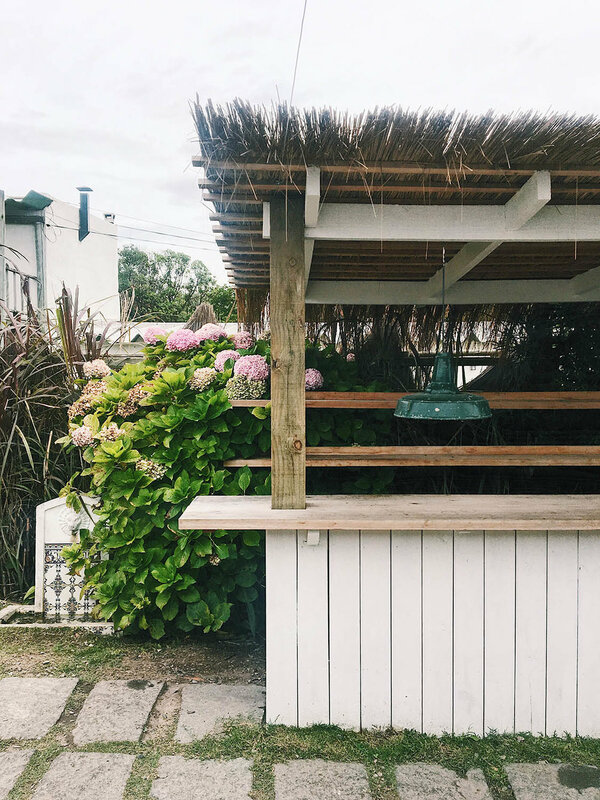 Last month, three friends and I spent a week in Jose Ignacio, Uruguay—a tiny beach town with major style. I stumbled upon an article about Jose Ignacio a couple years ago and it has been at the top of my travel wish list ever since. So, when a trip to Jose Ignacio came up in a conversation with a group of friends last fall, we decided we had to make it happen. From Buenos Aires (where we spent a few days on either end of our trip) we took a two-hour ferry to Montevideo where we picked up our rental car and made the two-hour drive to Jose Ignacio. You can also fly directly into Montevideo, but either way you’ll need a car to get to Jose Ignacio and so you can explore the surrounding area. We loved every minute of our time in this magic little town: from the lovely, uncrowded beaches, to the delicious food, to the abundance of inspiring architecture and design. But most of all, we loved Jose Ignacio's warm, relaxed energy and its leisurely pace of life. It’s the perfect place to spend several days—or weeks—with friends who love to eat, drink, and soak up the Southern Hemisphere sun. Below are some of the best places to rest your head, enjoy outstanding food, pick up a wool poncho, or marvel at the natural beauty of the area. Airbnb – One of Jose Ignacio's defining features is the modern architecture of its seaside bungalows, and if you’re traveling with a group, renting a house is a great option. We loved the house we rented with its backyard pool, ocean views, and chic all-white décor. Airbnb has lots of properties available in the area that would be a design-savvy traveler’s dream. If you can't find a house that suits your needs in Jose Ignacio proper, Manantiales and La Barra are a short drive away. Just remember, January is peak season and many homeowners won’t rent their houses for less than the full month. Playa Vik & Bahia Vik – Playa Vik and Bahia Vik are the Vik hotel group’s two beachfront properties in Jose Ignacio. Playa Vik is situated right in town, a few blocks from lots of restaurants and shops. Bahia Vik is just down the beach but a bit removed from the activity of town. Both hotels place major emphasis on architecture, art, and design without feeling stuffy or precious. And, in addition to guest rooms, both Playa and Bahia Vik offer freestanding residences that can be rented for families our groups. A third Vik property, Estancia Vik, is in the countryside a short drive from Jose Ignacio. The bakery at La Linda. Parador La Huella – If you visit Jose Ignacio, you have to eat at La Huella at least once. With simple, delicious food, an unbeatable location (right on the beach! ), great atmosphere, and the best people watching in town, it’s the perfect place for a long, leisurely lunch or a late, boozy dinner. Elmo – Tucked back in a residential neighborhood, the vibe at Elmo is like eating in a candle-lit secret garden. Pizzas are the standout on the menu so order a few plus some small plates and sides to share. La Susana - La Susana is the beachfront restaurant at Bahia Vik—one of the three Vik properties in the area. The menu is driven by local, seasonal ingredients with an emphasis on regional fare. Tables are spread across the beach, overlooking the ocean. It’s the perfect place for lunch and a glass of rosé on a sunny afternoon. Mostrador Santa Teresita – If you’ve ever been to Gjusta in LA or Ottolenghi in London, the concept of Mostrador will feel very familiar. The day’s selection of salads, vegetables, fish, and meat is spread across a big table at the front of the restaurant. Make sure to try the fresh baked bread (you’ll see them cooling on a table by the wood-burning oven) with some local olive oil. La Linda – This café is the perfect place for a morning cup of coffee, a casual lunch, or early evening drink. There is a bakery next door with fresh bread and pastries to take home. Garzon – Francis Mallman’s restaurant in the town of Garzon is a must for any serious foodie (or fan of the show Chef’s Table). From Jose Ignacio, Garzon is a half hour drive through idyllic farmland and olive groves. The restaurant itself looks unassuming from the outside, the space was once the town’s general store, but inside, the design and décor is that of a super chic country house. Outside, tables are arranged around a plunge pool—under romantic arbors or giant palms. The food is uncomplicated but expertly prepared with the freshest ingredients—and it comes with a serious price tag. But, the experience is totally worthy of a YOLO moment. At Garzon: (above) the very chic tented bar in the garden; (below) the dining room; outdoor tables. Mostrador: (above) the outdoor bar serving the day's special--aperol spritz; (below) casual seating; a tasty vegetarian lunch. Yoga at The Shack – Whether you’re a seasoned yogi or just enjoy a good stretch, a class with Isabella Channing at her studio, The Shack, is a must. Isabella is an amazing teacher—she teaches in both English and Spanish, just make sure you give her a heads up before class if you don’t speak Spanish—and her lovely, whitewashed studio is one of those places that feels both calming and energizing the moment you walk in the door. Horseback riding at Estancia Vik – We didn’t end up visiting Estancia Vik, but if you make the trip out to Vik’s property in the countryside, you can arrange for a tour of the grounds on horseback followed by lunch or drinks before heading back to the beach. Just make sure to make arrangements in advance. Day trip to Garzon – A meal at Mallmann’s is reason enough for a trip to Garzon, but you can also visit Bodega Garzon, the vineyard that produces all the wine served at the restaurant. Hugo Gonzalez makes the wool ponchos you’ll see all over town (lots of restaurants keep them on hand for patrons to wear on chilly nights) and sells them from a tiny stall at the artisan shops by the lighthouse. Lots of shops in and around JI sell wool wraps and ponchos, but Hugo’s prices are about $100 less than the boutiques in town. El Canuto sells beachy, bohemian apparel and accessories like straw clutches, flowy linen dresses, and airy palazzo pants. La Panaderia de la Mama is a bakery in town where you can also buy all kinds of Garzon products to take home as souvenirs, including wine from the vineyard. Marané is a men's swim brand based in Punta del Este with a shop in Manantiales (right across from La Linda) that opens for the high season. The bathing suits are pricey, but difficult to find outside of Uruguay, making them the ultimate souvenir to bring back for a stylish man in your life.